Bare lava from ancient times. Ok, technically ‘this’ is not our backyard, just one magnificent view from the Sunshine Coast Hinterland and an amazing area within easy reach of (what is soon to be) our new home. Oh how lovely to wake up to that view… congratulations! 🙂 and I can see there are lots of incredible places in your back yard that I wish were in mine. What a beautiful and haunting picture! Lucky you. Thank Calen. Within two hours rain set in and visibility was down to (almost) nothing as a heavy cloud settled on the mountain I was on. In retrospect I was so pleased I stopped along the road to take this photo on my way to, and didn’t say “I’ll catch it on my way back”. Had to look this up on the map. What a beautiful place to call home. So green! I’m so sorry Lorie, I’m normally so diligent with including links, and we are thrilled to be calling the Sunshine Coast our home. Only 10 days to go. 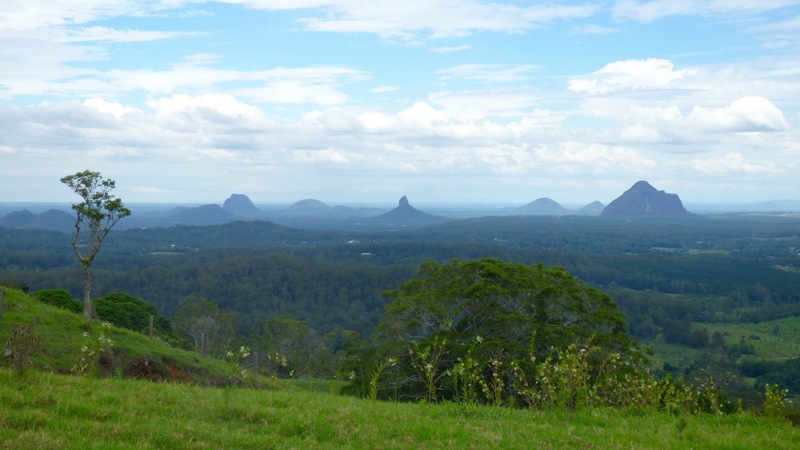 Lucky you – the Glasshouse Mountains, Mudjimba Beach and the mouth of the Maroochy River – my idea of the beautiful Sunshine Coast! 🙂 Dicky Beach, Moffat’s, Golden Beach, Kings – Oh the list goes on and on.